STRS Ohio’s total fund return was +13.7% for the year ending June 30, 2013. The market value of investment assets as of June 30 was $68.0 billion. The strong return for fiscal 2013 well exceeded the fund’s assumed actuarial return of 7.75%, but trailed the total fund benchmark return. Please note the little green figure in the lower right hand corner of the chart. 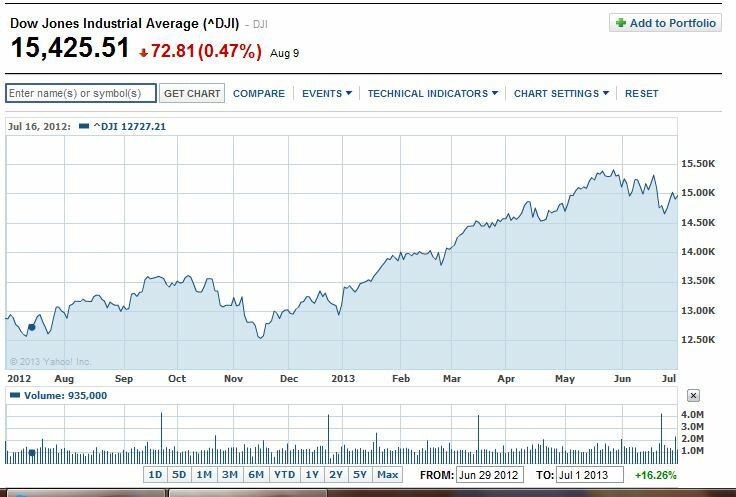 It shows a return of 16.26% for DIA for the same “fiscal” period of June 29, 2012 to July 1, 2013. In 2007 STRS published the composition of their portfolio. I think it is safe to say that the 2013 portfolio was similarly diversified. In their July, 2016 NEWS bulletin sent to every retiree, STRS announced that they had a five year total net return of 10.5%. I presume that means a compound annual return of 10.5%. You can see their statement by clicking HERE. VTI had a compound annual return of 10% over the same 5 year period. Think about it. With zero effort you could have effectively duplicated the results achieved by professional portfolio managers who are in the top 25% of their peers. Their results were achieved by a team of 10 professionals working 40 hours a week, 50 weeks a year to do no better than you can do by investing in only VTI.